The life and story of the Lady Jane Grey is one that I have not often read about. I’ve posted a couple of articles about Jane including her wardship to Thomas Seymour and her letter to Queen Mary I. When I was approached by Austin Macauley to read and review this book I was very excited to learn more about Jane. 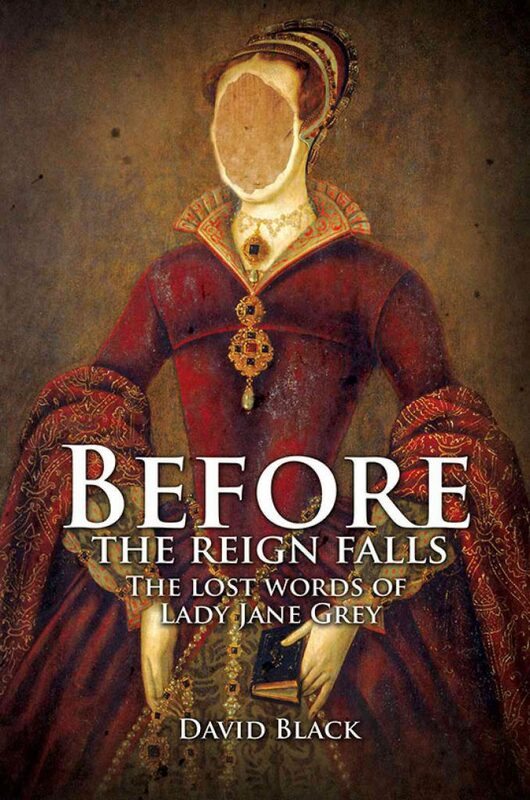 The book is called, “Before the Reign Falls – The Lost Words of Lady Jane Grey” by David Black. I really wasn’t sure what to expect from the story and from the beginning I wasn’t positive if it was historical fiction or just fiction. But when I finished reading it I realized that it was historical fiction since a lot of it was based on historical fact with embellishments to make the story more interesting. After further researched I discovered that it was indeed historical fiction. What do we already know about Lady Jane Grey? She was born in 1537 to Frances Brandon and Henry Grey – through both her parents she was related to royalty. Her mother was the daughter of Mary Tudor and Charles Brandon, while her father was a descendant of Elizabeth Woodville, queen consort of Edward IV. We also know that Jane was placed on the throne by her over-zealous father-in-law, John Dudley and ruled as queen for only nine days. Lady Jane Grey was later executed by her cousin, Queen Mary I of England. The prologue gives us a quick glimpse into the history of the reign of Henry VIII, so if you are new to the dynasty this will give you some ‘cliff notes’ on the topic. From there you go to the first chapter and meet the main characters of the book (besides Jane), it appears that it starts off in present day with a couple, Elliott and Alice. The couple are traveling to a location they are unfamiliar with on the back roads of England to assist Elliot’s friend with cleaning up and restoring his newly purchased property. When Elliott and Alice arrived they found a bunch of dilapidated buildings and overgrown landscape. From there the story goes into telling us about how much work had to go into restoring these buildings and a bit of history into the previous owners of the buildings. The story progressed to the couple having to stay one of the buildings, a worn down barn-type thing. While I appreciate that the author was building the story and the characters it left me wanting the story to progress to Lady Jane Grey. The book itself is about 261 pages long and it wasn’t until almost 100 pages in that we got around to the topic of the book. To me this is when the story really started to get good and I had a hard time putting the book down. At this point I’ll be honest, without all the back story of the characters I would not have been able to follow along as things were unveiled to the reader. We learned about the relationship between Jane and her cousin Queen Mary I and Mary’s struggle with her decision to execute her cousin. We also get a brief glimpse at the relationship between Jane and Elizabeth Tudor. When the story is told by Lady Jane we get a bit of insight into her relationship with her parents, her in-laws and her husband, Guildford Dudley. For some, it may be difficult to keep up with a different perspective in the story. It is written from the perspective of present day and then you have a couple of characters from the past that tell their story. As you’re reading it you realized that these two characters lives are intertwined. This book takes a different look at history. What if type of history. I remember thinking while reading it on my gosh what if this really happened? There’s twists and turns that you don’t expect and you’re pleasantly surprised at the outcome of the story. I really want to tell you what happens in the book but I don’t want to ruin the surprise for you! I have a hard time deciding what to rate this book because the last 150 some pages of the book were fantastic, but it was the first 100 that left me wanting more. So with that being said I’m gonna give it a 4.5 out of 5 stars. And I would definitely recommend reading it if you want to delve more into the history of Lady Jane Grey.